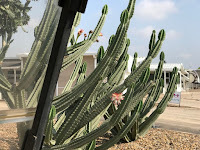 For years as members of FMCA, we were aware that the president of FMCA (now ex-president) had established a company based in Searcy, Arkansas, that would rebuild your RV windows that were fogged up or had moisture in between the panes of the double-paned glass. While our Phaeton was still under warranty, we had several windows replaced. The driver's window I think was done three times. Tiffin would simply replace rather than fix the windows. Now that the coach is not under warranty, I did not want to take it to Tiffin and have them replace the windows with other "like" windows that would fail in a short time. So we decided to head to Searcy and have our bad windows fixed. On the way, we stopped in Gretna, Florida. When we pulled in, I noticed the coach two down from us as being familiar. Our friends, Rod and Marsha, who were the hosts at the Tiffin Campground for years, were camped there! So we visited a while. They had left Florida that morning, same as us. They mentioned they were headed to Red Bay in June and we were too! So it seems we will meet again. The next morning we broke camp and drove on. We stopped at a Corps of Engineers Park along the Tombigbee River. It was a beautiful camp and we were right on the river. We saw a barge going through soon after we stopped. That was the only one we saw, but I'm sure there are more moving up and down that river. They also access the Tenn-Tom Waterway, which connects the Tennessee and the Tombigbee to the Gulf of Mexico. We were able to sit out for awhile, but once again, RAIN! It seems there is no end in sight. We we were safe and snug in our campground. We finally got into Searcy on Friday afternoon and set up camp at Whitney Lane RV Park. It is owned by a very kind older gentleman who had just lost his wife three weeks ago. He put us on his best site. It was a full pad with 50 amp and full hookups. It was the last site on the row and we stepped out with a view of a grassy yard running back to a woods. We had gotten in late afternoon and it was hot, so we plugged in. After waiting a bit, our power still had not kicked in. Julian, the owner, had pointed out that the other hookup was bad because a plug had overheated and he hadn't yet replaced it. So Terry tried a couple things and nothing worked. We had to call Julian back. He came back and prepared to open up the box and fix the problem. He had built the park and knew how to do all of this, but this stuff is right up Terry's alley, so he helped him. The box was full of mud dauber nests, long since vacated, and the breaker was bad. But they got that all fixed up and decided to fix the second box which had some bad wire due to the overheated plug at one time. So the two guys worked till they had that done and Julian spent another hour just talking. He is such a sweet man and he no doubt is lonely having just lost his spouse. I think Terry earned his angel wings talking with him. He does have family around. His sister across the street, a daughter next door and another relative next to her. So I'm sure they all check on him. On Tuesday after Memorial Day, we were up early and over at the FogDr. garage at 8 a.m. They were ready for us and backed us right in and up to the building. The have full hookups as well, but we just plugged into electric so we would have air. They came out and asked us which windows needed work, so we walked around as they labeled them, nine total. Then they took out the four in the bath and bedroom. They had told us it would take two days so we were prepared to stay the night there. But they had those four done by noon and pulled the others in the front and said they would try to have them all done. And they did! Very professional people to work with. They worked fast, but not too fast that you questioned their work. They had a definite system for removing all the windows and worked steadily till the job was done. Once they were finished, we went to get some supper and once back in the motorhome, we started hanging valences. Terry had made all our wood valences and they are beautiful, but it was a lot of work removing them with the blinds in them. And a couple of them are really heavy. We had done all that before we got there, so all they had to do was do the windows. So now we had it all to put back. And we had several cabinets we had to empty and leave empty till they were done, so in addition to having wood valences all over the place and in the car, we had boxes of household goods sitting under the table. It was a mess. But by the time we were ready for bed, it was all done. Our new windows look great. We can actually see out of them for the first time in years! We spent the night in their parking lot and slept in. Wednesday, yesterday, we got up and left their place at 9 a.m. It was a great stop and after leaving $$$$ in Searcy, we went on down the highway. The guys who did our new mask on the front didn't want us driving off into the sunset just yet. Especially with the monsoon style rain we've been experiencing. So we signed up for another three days here at Tampa East RV Resort and will be leaving on Saturday morning. While we were in Tampa we had almost torrential rains the entire time. We really didn't get out and do much because we didn't want to run in and out of the rain. We did go to Ikea one day and shopped. Bought a couple things, but not much. We did have lunch there. I had the salmon lunch and it was very good. When we left, we took a drive through Ybor City, the old cigar district. I guess that's what you call it. We had been through there years ago, but we may have missed the shoppes area because I didn't remember it. A lot of little restaurants and bistros now. All the kind of places we can't go because of diet restrictions. Saturday we left Tampa East and drove 50 some miles up to Bushnell. We had reservations at Blueberry Hill for three nights. It's a very nice camp. They have a lot of activities for campers, but their season is over, so not much is going on. It would be a great camp if you weren't packed in so tight. It is a fairly new camp, but the spaces are just a bit short for us and not much space between campers. They have a "moat" that surrounds the camp and warning signs telling of alligators. They weren't telling lies, either, because we took pictures of two. One was a baby, the other was about 4-5 feet long and capable of taking small pets. Good advice to stay away! We went to the Webster flea market on Monday while we were there. Big disappointment. Course, the season is over. But the real reason it was so dead was no doubt the amount of rain they've had. We enjoyed our time in Florida. We got to see the kids and granddaughter and had some work done on the motorhome. But it's time to roll. We hit the road tomorrow. Time to roll . . .
Our time with the kids came to an end, but not before we spent a glorious day Saturday with the kids. We started out by planning on an air boat tour, but the weather did not cooperate and we eventually scrapped the idea. We wanted a 30 minute ride, not knowing how Brynlee would handle it, but no one was doing those on Saturday. So after driving to the various venues and threatening skies, we decided to head to the restaurant, Grills Riverside, where we enjoyed a dinner inside, but at the window, so we could see the Indian River. We actually spotted a dolphin swimming close to shore. After dinner, we returned to the camp to let Duchess out and feed her, then we headed back over to the kids' again and spent the evening with them. It was a great time and we hated to go. I always hate to leave kids and grandkids, but we have other places to go. Terry had made an appointment to get the front mask removed from the motorhome and a new one applied. We left Sunday morning to go to Tampa, actually Dover, just east of Tampa. We arrived in the afternoon and it was clear the entire way, but soon started to rain. It really poured the rest of the day and all night. They had told us they wouldn't be able to do the mask if it rained. As it turned out, their other appointment didn't show and they were able to put us inside the building and do it. So Monday morning we were over at Florida Applied Films, just about 2 miles from the camp and they took about 2 hours to remove the paint protection film that was on it. The problem with these films is that rocks pierce them and then mold forms underneath. I actually thought we would have to repaint the entire front cap, but as it turned out the paint underneath was good and not damaged. So after it was removed, we returned to camp. We needed some touch up paint and we were told to go to Lazy Days and get it mixed for us. We went on over and it didn't take long to get our order in. We removed the refrigerator hatch door which contained the three colors we needed and the paint shop was able to mix up some paint for us. They called when it was ready a few hours later and we picked it up. The new mask was ordered and we made another appointment for Wednesday (today) morning to have it applied. It had continued to rain and pour every day we have been here, but today was sunny with a few clouds here and there. We took the coach back into the building at the shop and they started work immediately. By the time the mask was delivered, they were ready for it and got it installed. It looks great. There was a Phaeton logo on the the front which had to be removed in the process and we weren't going to put any back on. But the logo has been there for over 12 years and there was a shadow where the logo had been. So the guy offered to do a decal, which we approved. It is the same style looks very nice. We are very pleased, especially since we didn't have to repaint the front end. While we were waiting on things, we drove up to Zephyrhills and looked around at some RV sites. But we didn't find anything Terry wanted to go back to see, so no news there. We did have breakfast Tuesday with some great friends, Bill and Helen. We met them when we started fulltiming. They live in the Villages now and we rarely see them anymore, so this was a special time. 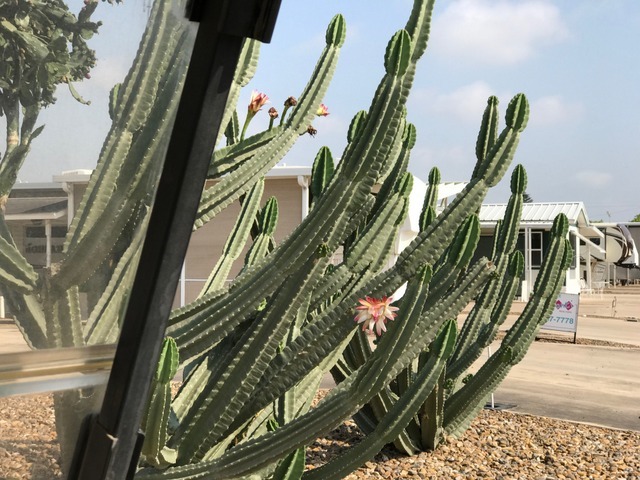 My friend, Josie, is still in the park in Texas and took even more pictures of our cactus. 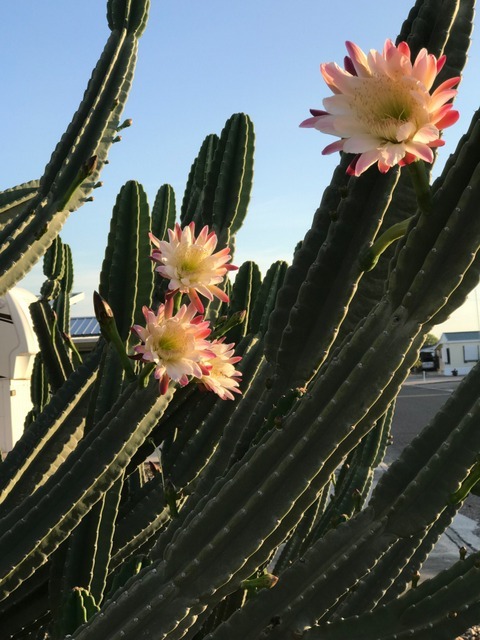 They continue to bloom more and more and are really beautiful. We are here for a few more days because the mask needs to "cure" before driving off, especially if we have a lot of rain. So I see a casino in my future as well an IKEA! Whoo hoo! Our time with the kids is coming to a close. This week at the park has been busy with wildlife sightings. We have seen an abundance of the gopher tortoises, Sandhill cranes, bunnies, turtles, ducks, a pileated woodpecker and we even spotted a lone eagle! We have seen the eagle on past trips here and it is always a thrill. Yesterday was the launch of a SpaceX Falcon 9 rocket. We were able to see it from the cul-de-sac in front of Brandon's house. Pretty cool. A few minutes later we heard the rumble from the rocket launching. We heard later what we believe to be the rocket boosters returning to earth. They actually are landed on a drone ship in the ocean and reused. Pretty clever. 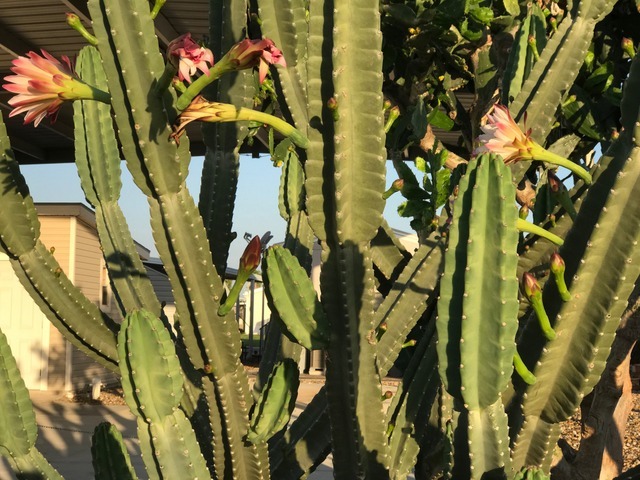 While we have been gone from Texas, our cactus have been busy blooming. They started the week we left there. We have never seen them blooming. 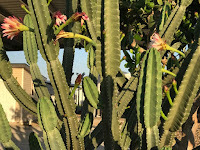 Our paddle cactus always have flowers on them, but they never "bloom" and the long armed cactus (don't know the name) have never produced blooms while we are there. Dang, but they're beautiful. A friend who is still there took these this week. Once done with our spring appointments, we hit the road for Florida. Megan and Brandon had a trip to Cancun the first week in May and we agreed to stay with Brynlee during that time. This was an incentive trip Brandon earned for reaching some really high sales goals set by the company. He is doing very well with his company, loves his job, and they reward him accordingly. We traveled long days to get there, more than the usual 250 miles we normally do, but Brandon had an event on Saturday he wanted Terry to go with him to, so I got him there just before noon on Saturday. Brandon had tickets to EggFest, an event sponsored by the Big Green Egg and Wassi's, a meat market in Melbourne. They were cooking on 200 Green Eggs, demonstrating how they work, etc. The Eggs they demo are then sold at a highly reduced price. You have to sign up beforehand and Brandon had two free tickets, so he took Terry. They enjoyed their time, got to eat all day and at the end of the day, had his Egg loaded in the car and brought home. It was a chore getting it out of the car and through the house to the lanai, as it weighs 200 some pounds. But a neighbor came and helped and all went smoothly. The kids left the next day for their flight to Cancun after dropping Brynlee off at school. I picked her up later that day and the fun began. We had a great week. I was the chief chauffer, driving her from one event to another. LOL But we had great fun and enjoyed our time together. I stayed at the house with her. Terry was there during the day and we even brought Duchess, who got along well with Jax. Terry would go back to the motorhome at night. Brynlee had school, gymnastics, dance, Gymboree, and T-ball during the week. We were busy! The kids arrived back on time Friday evening and we all met at Sonny's BBQ where we had dinner together. Sunday Brandon cooked out on his Green Egg and we had steak, shrimp, salmon, burgers, asparagus, corn on the cob, salad, cake and watermelon. It was a grand feast and we lots of leftovers. In other news, Mom returned to her home last weekend and is doing well. She gets visits from home health and the physical therapist, but is able to get around on her own and even shower. So she is recovering very nicely. Nita even took her to church yesterday and dinner out and she enjoyed herself immensely. Prayers have been answered. Today we are going to look at some RV lots in the area. Would like to find something, but pickins' are slim. Tonight we are going to Diane's, Megan's Mom's, for dinner. We are looking forward to that.